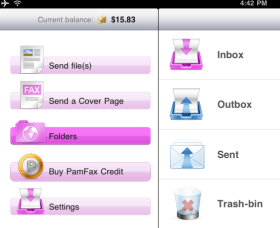 On Friday PamConsult released PamFax for iPad, providing access to PamFax services from the most natural platform format for replacing a fax machine (or the fax feature of an All-in-One Printer). submitting a fax for delivery. 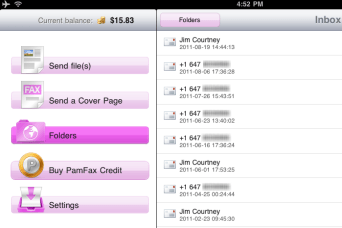 In lieu of accessing the PamFax user portal, the Folders, Buy PamFax Credit and Settings buttons shown above take over the primary functions of the PamFax portal. For instance the Folders tab offers a menu for access to an Inbox, Outbox, Sent and Trash-bin folders. Each of the folders provides almost instantaneous access to individual faxes and the ability to easily view them. In fact, I find this process easier than accessing them via the web-based PamFax user portal (although they are also available there). It’s fast on delivery: On my test fax – with all steps handled on the iPad — (selected a file from a Dropbox folder, added a cover page, sent the file to my PamFax Inbound number and viewed the resulting file in PamFax Inbox – another Dropbox folder), the time between Sending the fax and Receiving it in the Inbox was somewhat less than a minute. This reflects recent “Summer Release 2011” to the PamFax “Back office” infrastructure that has significantly improved fax delivery speed. As is normal with any PamFax transmission, notifications can be sent via email, Skype chat and/or SMS messages. Bottom Line: at this point I am cancelling my Bell Canada fax line and using my iPad as my primary fax “machine”. The only feature for which I need a PC are the scanner on my All-in-One multifunction scanner/printer for importing original document scans; in that case I can use PamFax on my PC or MacBook Pro for sending these faxes. I am replacing a $15/month phone line with an all-inclusive $8.70 per month Professional Plan service, including 20 free faxes per month and ongoing archival fax storage, and low “per page” charges for sending additional fax pages (in lieu of using Bell Canada long distance for sending faxes internationally). A Basic Plan and Pay-As-You-Go On Demand service are also available. Now if PamFax could just add a SkypeOut link to the “Remove this number from our Fax list” number at the bottom of every “spam” fax. Voice On The Web’s Skype Reference Guide, under Hosted Services, provides a complete overview of PamFax: Obligation-Free Fax Worldwide On Demand. Full disclosure: while the author has purchased a PamFax subscription (and cancelled a phone line for fax use), some links on this page lead to participation in the PamFax affiliate program.